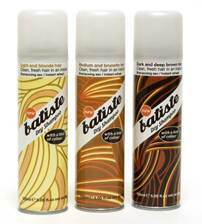 Batiste have introduced a range of dry shampoos with a hint of colour specifically designed to complement your hair colour whilst instantly giving you clean, fresh hair full of body and texture. Left in at the roots, it’s great for blending in regrowth on coloured or highlighted hair and can even disguise stray greys too. Brilliant for banishing oily roots and freshening-up dull, lifeless hair – Batiste Dry Shampoo can now bring a little colour to your life! The three new variants, each with a hint of colour to complement light and blonde hair; medium and brunette hair and dark and deep brown hair. I love the retro feeling packaging and this is a great idea to give a little umphh to your hair colour if it is looking a little dull and washed-out. I have not coloured my hair for a good 6-7 months so my highlights have grown out a lot (long over-due hair appointment needed!) I have been testing out the blonde spray in the range and its great for adding subtle colour to your hair, however I'm not sure if this would work if you had really dark roots. It smells really fresh with a lemon citrus scent and my hair feels quite silky afterwards. Priced at £3.05 for 150ml from http://www.boots.com/, http://www.superdrug.com/ and all good retailers and pharmacies. Let me know your thoughts if you try it! I'm currently in the 3 inch stage of roots in a bid to grow in my natural hair, would love to be able to blend the colours a bit more seamlessly. The citrus scent sounds appealing too. This looks cool! It seems like more and more dry shampoo products are being introduced! I would definitely wanna try this one out, hopefully they sell it in canada!! !